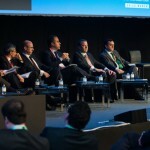 In five or six years’ time, the wind energy sector will see an end to regulatory uncertainty, increasing levels of consolidation within the industry and leaps ahead in technology – said CEOs speaking at EWEA 2014 in Barcelona today. We will see “advanced technology that is subsidy free,” said Anne McEntee, Vice-President of renewables at GE, adding that the sector needs to get more inventive. Xabier Viteri, CEO of renewables at Iberdrola, concurred saying that technological breakthroughs and innovations will surface by 2020. While Anders Runevad, President and CEO of Vestas, said that in the offshore market we will be “starting to see the results of offshore investments,” Viteri said that cost cutting in offshore “is a must”. “Without cost reductions there will be no offshore industry after 2020,” he warned, adding that costs must come down by at least 40%. Alfonso Faubel, Senior Vice President at Alstom Wind, said that a lot needs to be done in the offshore value chain, but he noted that in France his company’s new offshore projects will create 8,000 jobs. Meanwhile, João Paulo Costeria, CEO of EDP renewables sounded a note of caution on the electricity grid, saying that we will still be talking about interconnection by 2020. Coming from a US perspective, McEntee said that in Europe every country has its own grid which is a suboptimal approach. Grids should be interconnected or optimalised nationally, she stated. For Xabier Etxeberria, Business Chief Executive Officer at Gamesa, the industry must cooperate and share its knowledge to move forward. “Together we can win,” he said. In addition to offshore, Faubel said that new markets in countries like Brazil are very important. We can enter these new markets in Latin America with our technology and our know-how, he said. However, Etxeberria said that it is very important to understand the culture in different markets, “you have to understand the country before the business,” he said.